A gesture of peace — Chico MacMurtrie’s Border Crossers. Known for his amorphic robotic works, Chico MacMurtrie visits Ann Arbor to work together with a band of driven University of Michigan students hailing from every facet of the university — from the Stamps School of Art & Design, School of Engineering, Ross School of Business, just to name a few — to create more prototypes for his ongoing project, Border Crossers. 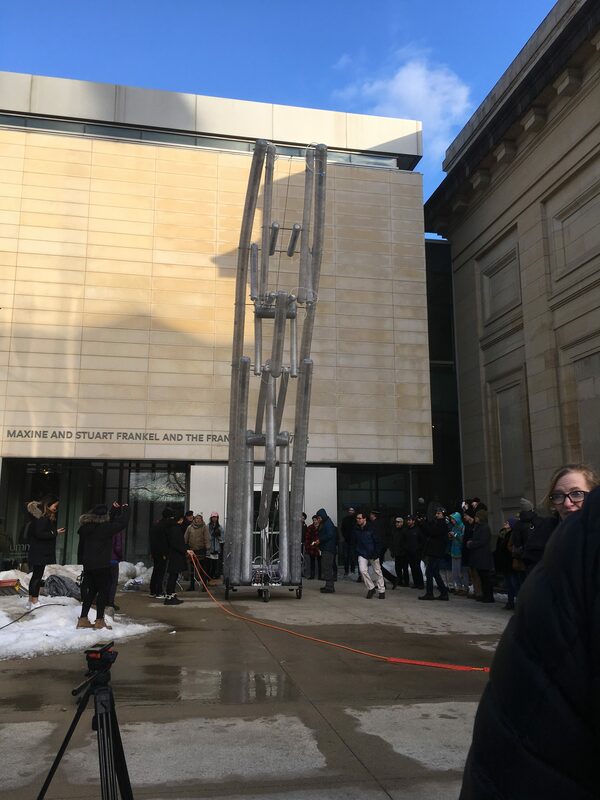 It was a windy Friday afternoon, with the occasional glimpse of warm sunlight peeking through the gloomy winter clouds of Ann Arbor, when I approached the UMMA. As I turned the corner, gritting my teeth and bearing the cold, I saw a mass of people gathered around the UMMA’s entrance. I automatically understood for what reason — the students working under Chico MacMurtrie had worked tirelessly on what Chico himself called an “impossible project” and produced their own Border Crosser. And the people gathered around it were watching its unveiling. And I, of course, joined them. This tall structure was an elaborate contraption that stretched itself further and further into the sky, as if reaching out for something. Despite its deceptively strong appearance, the Border Crosser is actually very delicate, built from relatively thin metal parts and then wrapped by inflated parts. Had the sun hit the Border Crosser, it would be a little more obvious (you would be able to see the structure inside the inflated portions). 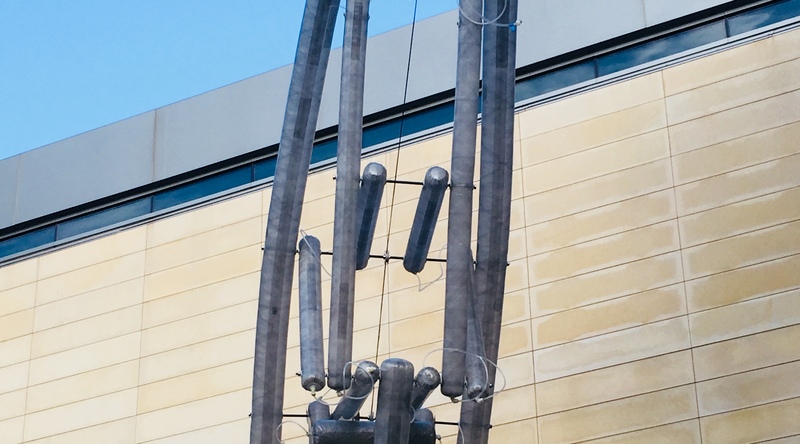 It swayed in the wind, which seemed to worry the students who worked on this project for weeks, as it continued to bend and stretch delicately. Evidently, after having talked to some of the participating students as well as hearing it from Chico MacMurtrie himself, this Border Crosser was built with the same intention that all Border Crossers have: to cross borders peacefully, as the name obviously suggests. Actually, though, I had originally thought the name Border Crosser sounded kind of aggressive, because there is so much intent and purpose in the act of crossing borders. When really, once you come into contact with an actual Border Crosser, you would immediately realize how delicate they are. When asked about the Border Crossers’ fragility, Chico MacMurtrie answered that the Border Crossers are meant to showcase the delicacy of crossing borders. I thought it was very intriguing and very relevant. Chico MacMurtrie’s project, Border Crossers, is the start of a conversation in connecting the world and understanding the fragility of connecting with others, most notably countries that border our own. Another question posed for MacMurtrie addressed the fact that fences with barbed wire and fences that are bent on maintaining those borders often exist, and that the Border Crosser would likely meet its end in contact with such fences. Chico MacMurtrie chuckled at this question and related it back to the fragility of making connections, as that is what the Border Crossers represent — the action of making a connection, or “crossing borders,” is ultimately a risky feat, and that sometimes there are borders that are harder to cross. Sometimes there are fences that are built to keep others out, and in understanding the intention of the Border Crossers, watching how slowly and intricately they move to their destination, you understand how difficult and precious of an act it can be. Honestly, just putting my thoughts into words chokes me up a little bit. Maybe it’s the music I’m listening to, low beats and mysteriously sad and profound, maybe the concept behind the work relates to my life personally, maybe it’s the cruelty of reality and the world that we live in, maybe a combination of it all, who knows. Chico MacMurtrie’s Border Crossers are meant to show connections, and that in itself is such a powerful message, especially in this day and age, where connections are either hard to make or too shallow to really mean anything. Border Crossers are here to remind us of this, not necessarily to encourage crossing actual borders, but rather, to encourage peace between those separated by borders.